US president Donald Trump has reportedly received his first court backing on a policy barring trans people from serving in the military. The US court of appeals for the District of Columbia circuit overruled a previous decision by a Washington DC federal judge, which had blocked the policy. It is the Trump administration’s first legal victory on the proposed ban, reports the Guardian. However, the decision will have little impact because other federal courts have ruled against the policy, with these injections applying nationwide. The US Supreme Court is set to put out a ruling on the issue in January. 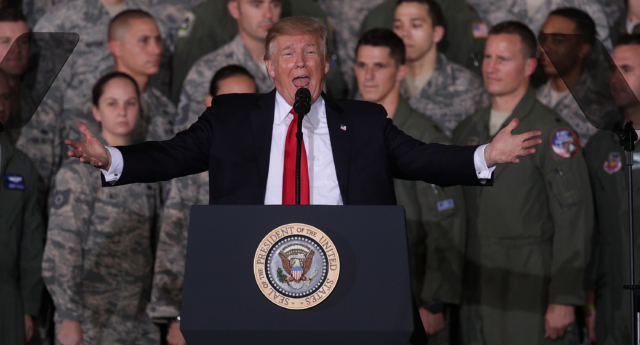 It comes after a poll of US military personnel and veterans found a majority in support for President Donald Trump’s policy banning trans troops. The poll, conducted by Smithsonian, Stars and Stripes and George Mason University, asked 1,031 service members and veterans about their views on military policy. It found 61 percent of respondents were against trans people serving in the armed forces. Trump first proposed blocking all transgender people from serving in the military in a series of tweets in July 2017. In November, the Trump administration asked the US Supreme Court to fast-track its review of the proposed trans troops ban. Lambda Legal counsel Peter Renn, who represents transgender troops battling the ban, said at the time: “There is no valid reason for the Trump-Pence administration to try to short-circuit established practice and ask for review before the federal Courts of Appeal have even had an opportunity to rule.